Are 19.6 pounds of CO2 produced from burning a gallon of gasoline? About 19.6 pounds [8.89 kg] of CO2 are produced from burning a gallon of gasoline that does not contain fuel ethanol. About 12.7 pounds [5.76 kg] of CO2 are produced when a gallon [3.8 litre] of pure ethanol is combusted. I am not a climate change denier, but this just seems like an unreasonable statement without explanation. How is it possible for 5-10 pounds (2.3—4.6 kg) of liquid to produce 20 pounds (9 kg) of gas? This answer provides an example on how to address this question by citing basic science. Please ignore any voting on it. I won't perform any calculation here as they are not on topic on Skeptics, but the confusion seems to arise from the fact that in combustion a fuel (in this case, gasoline) and an oxidant (in this case, oxygen in the air) combine to produce other compounds, among which is carbon dioxide (CO2). Combustion or burning is a high-temperature exothermic redox chemical reaction between a fuel (the reductant) and an oxidant, usually atmospheric oxygen, that produces oxidized, often gaseous products, in a mixture termed as smoke. So as you can see, we have two substances combining. Applying the principle of conservation of mass, the output needs to have the same mass as the input, which is more than only the fuel. The conservation of mass was obscure for millennia because of the buoyancy effect of the Earth's atmosphere on the weight of gases. For example, a piece of wood weighs less after burning; this seemed to suggest that some of its mass disappears, or is transformed or lost. This was not disproved until careful experiments were performed in which chemical reactions such as rusting were allowed to take place in sealed glass ampoules; it was found that the chemical reaction did not change the weight of the sealed container and its contents. Of course, this only shows that the total mass of the combustion products can be (and usually is, except for some special cases like solid rocket fuels that contain their own oxidizer) greater than the mass of the fuel alone. Showing that this is also true for just the CO2 (not counting any other combustion products, such as water vapor or soot) produced when gasoline is burned in a car engine would require either direct experimental measurement or non-trivial calculations based on the chemical composition of gasoline and knowledge of the temperatures and air and fuel ratios found in typical modern internal combustion engines. Such calculations would be off-topic for this site, so I will not provide them; if desired, they may be found in textbooks on chemistry or automotive engineering. Still, even without determining exactly how much CO2 burning a gallon of gasoline will produce, we can at least see that it can be more than the mass of the fuel, since some of the mass will come from oxygen in the air. It seems impossible that a gallon of gasoline, which weighs about 6.3 pounds [2.9 kg], could produce 20 pounds [9.1 kg] of carbon dioxide (CO2) when burned. However, most of the weight of the CO2 doesn't come from the gasoline itself, but the oxygen in the air. Therefore, to calculate the amount of CO2 produced from a gallon of gasoline, the weight of the carbon in the gasoline is multiplied by 44/12 or 3.7. We can then multiply the weight of the carbon (5.5 pounds [2.5 kg]) by 3.7, which equals 20 pounds [9.1 kg] of CO2! An article at Slate draws similar conclusions. It is possible to verify this idea from multiple sources that are independent of the U.S. Government. I'm going to leave verifying the exact numbers in the question out of scope of this answer, for reasons to be explained shortly, and stick to how you can verify from other sources the underlying claim being taken issue with: that the mass of the liquid is less than the mass of the gas. Some non U.S. Government sources for this are multiple textbooks on thermodynamics. The combustion of petrochemicals is, understandably, a well-documented process in science and engineering, and there are a lot of sources on this. When something burns, it is combining with oxygen, i.e. oxidizing. Rao gives the actual chemical equations for such oxidization, and goes into detail about the purity of the fuel and some generalizations that descriptions of the process tend to make. You may know that the conservation of mass and energy (E=mc2) is one of the basic laws of nature. The amount of matter and energy never really change. […] When you burn gasoline, you not only release its chemical energy as heat and light, but you also release matter in the form of carbon dioxide, carbon monoxide, carbon, and water. Every bit of the original matter is conserved. The reactants consist of fuel and an oxidizer (usually oxygen). The fuel in a combustion can be gaseous […], liquid (e.g. gasoline or ethane) or solid […]. So what the various professors have told us so far is that there is an underlying physical conservation principle, that there are two inputs (the reactants), and that the mass-energy of the the inputs must equal the mass-energy of the outputs. But you might challenge this on the principle that carbon dioxide is only one of the outputs, and that the conservation principle is the conservation of mass-energy not of mass alone. Maybe the mass of one of the other products is greater, and thus the mass of carbon dioxide is not necessarily greater than the mass of gasoline that has been burned. Maybe some of the mass turns to energy. Nellis deals with the latter. This is a chemical reaction, not a nuclear one. Atoms must be conserved even though the mass of each substance involved in the reaction may change. Let us assume that C8H8 is representative of gasoline. (In fact, gasoline consists of many different kinds of hydrocarbon molecules, but its average molecular weight is close to that of C8H8.) Equation 1.2 shoes that one molecule of C8H8 produces eight molecules of CO2. Because the molecular weight of C8H8 is 114 and that of CO2 is 44, 1kg of our gasoline produces (8 × 44) ÷ 114 = 3.1 kg of CO2. 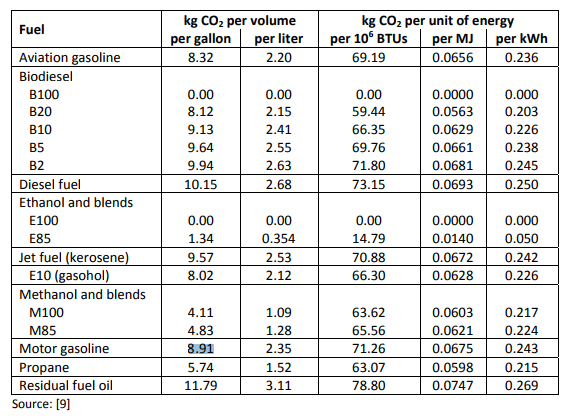 The density of gasoline is about 70 percent that of water […] and because the density of water is 1000 kg/m3, 1 litre (0.001 m3) of gasoline produces 3.1 × 0.7 = 2.17 kg of CO2, or in the U.S. system 1 gallon (3.785 l) of gasoline produces 18.1 lb of carbon dioxide. A similar worked example, coming to the figure of 8.196kg of CO2 for 1 gallon of gasoline, is given by Professor Tom Holme of Iowa State University and Senior Lecturer Larry Brown of Texas A&M on page 132 of Chemistry for Engineering Students (Cengage Learning, 2005, ISBN 9780534389741). Why the discrepancy, though? These are not the U.S. government figure. The answer lies in the textbooks, again. Internal combustion is complex. There are entire books on this specific subject, after all. The combustion of a hydrocarbon fuel is considered to be complete if all of the carbon and hydrogen contains in the fuel are converted into carbon dioxide and water, respectively. The minimum amount of air required for the complete combustion of fuel is called the stoichiometric or theoretical air. Usually, the combustion process does not go to completion unless the amount of air supplied is more than the theoretical air. The amount of air actually used in a combustion process is expressed in percent theoretical air or percent excess air. The amount of air supplied over and above the theoretical requirement is called excess air. We'll need to know the mass of a gallon of gasoline. As you might guess, this depends on the exact composition of the gasoline in question. So there is a set of assumptions, about how close one's gasoline is to the theoretical pure octane that the textbook calculations (explicitly) assume, and about how much fuel is actually burned in real automobiles, that can affect the answers. However, the underlying point, that the mass of the carbon dioxide is greater than the mass of the gasoline because mass-energy is conserved, there is another reactant in the reaction, and the chemical equation forces the ratios of reactants to products, is there in these and many other sources. a. much larger than the petrol? b. about the same as the mass of the petrol? c. much smaller than the petrol? Scientists would answer "a" as the process of burning fuel is constructive because the atoms of the fuel are combined with oxygen. It was found that many people believe (incorrectly) that the amount of exhaust will be smaller than the petrol. For what they are referring to, which itself cites further works and which again is yet another source for verifying the claim being disputed in the question, see pp. 82 et seq. of Michael Littledyke's, Liz Laikin's, and Keith Ross's book Science Knowledge and the Environment (2000, London: Fulton). Richard Stone (2012). "Combustion and fuels". Introduction to Internal Combustion Engines. Palgrave Macmillan. ISBN 9781137028297. Kalyan Annamalai and Ishwar K. Puri (2006). Combustion Science and Engineering. CRC Press. ISBN 9780849320712. Kenneth W. Ragland, Kenneth M. Bryden (2011). Combustion Engineering. CRC Press. ISBN 9781420092516. D. Bradley (2012). "Combustion in Gasoline Engines". In P.M. Weaving. Internal Combustion Engineering: Science & Technology. Springer Science & Business Media. ISBN 9789400907492. This answer provides an example on how to address this question by citing calculations performed by competent authorities. Please ignore any voting on it. Finally, to calculate the CO2 emissions from a gallon of fuel, the carbon emissions are multiplied by the ratio of the molecular weight of CO2 (m.w. 44) to the molecular weight of carbon (m.w.12): 44/12. Unfortunately the EIA source seems to be really hard to find (404) and I can't verify their claim exactly, but given the other numbers, they are at least in the ballpark. This answer provides an example on how to address this question by citing multiple reputable fact checkers and sites. Please ignore any voting on it. It seems impossible that a gallon of gasoline, which weighs about 6.3 pounds, could produce 20 pounds of carbon dioxide (CO2) when burned. However, most of the weight of the CO2 doesn't come from the gasoline itself, but the oxygen in the air. [a gallon of gasoline] equals 20 pounds of CO2! How can a gallon of gasoline produce 20 pounds of carbon dioxide? Actual weight ratios will of course vary, since gasoline is not purely octane. In general, however, when you burn carbon fuels they are in "reduced" form, that is, the carbons in the molecules are attached mostly to hydrogen atoms. When they are burned, the carbon becomes "oxidized" (literally, combined with oxygen) to make CO2. Since oxygen is far heavier than hydrogen, the product is heavier than what is burned. What is the weight ratio of CO2 released to fuel burned? We started by asking people to think about the effects their cars have on the environment: "For each gallon of gas your car burns, it releases about 19 pounds of carbon dioxide." Explainer readers wondered about this statistic: If a gallon of gasoline weighs about 6 pounds, how can it produce three times that much greenhouse gas? The carbon from the gasoline mixes with oxygen from the air. Gasoline consists mostly of hydrocarbons—chains of carbon encircled by atoms of hydrogen. When the hydrocarbons burn, they break apart and recombine with the air. This reaction produces heat, as well as two chemical byproducts: water and carbon dioxide. Not the answer you're looking for? Browse other questions tagged chemistry climate-change .